The skills shortage in UK manufacturing is causing uncertainty around the future of the industry, new research from the professional division of Miele, a manufacturer of commercial laundry and dishwashing appliances, has found. 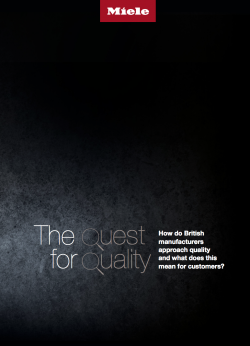 80% of British manufacturers agree that skilled workers are the most important factor for achieving quality across the supply chain: ranking higher than technology, testing procedures and financial investment. Yet almost half of respondents said they find it difficult to develop these skills amongst their workforce, with many predicting the problem to worsen over the next five years. With access to skilled workers causing the biggest barrier to quality for one in five UK manufacturers, many are turning to in-house training rather than sourcing talent from further education. 46% of respondents said they prefer to train staff on the job rather than recruit using apprenticeships (26%) or universities (11%). Yet despite the number of UK manufacturers taking training into their own hands, 30% believe the lack of access to skilled workers will be problematic in the next five years, putting the future of quality manufacturing at risk. Although able to identify a worsening skills gap, respondents still strongly believe that the UK develops the third-best quality skills in the world after Germany and Japan and three quarters said they would consider hiring from abroad if they were unable to source the best quality product skills in the UK.